This review of Prospa Business Loans will help you gain a better understanding of what Prospa stands for as a company, who is behind the company and factors that differentiate it from their competition. Read the following Prospa review and it will also outline the requirements from all potential buyers. Documents Required to Apply: Loan details, your personal information, business name, estimated annual revenue, business address, entity type, how long you’ve been in business, amount you pa in rent, and three months of your business’s bank statements. Requirements to Apply: Prospa likes to see that you’ve been in business for several months and have a consistent source of cash flow. Minimal Interest Rates: Operates with a variable interest rate that’s calculated in a “factor rate” form that’s a decimal – not an interest percentage. General Feedback from Clients Online: Feedback from clients is generally positive. Prospa boasts a 95% satisfaction rating, and the vast majority of online reviews from clients report a satisfactory lending experience. 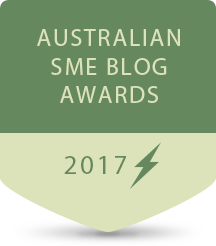 Awards and Recognition: AON Hewitt Best Employers Program, 2017; Best Medium Business Telstra Business Awards, 2017; Best Fintech Place to Work Fintech Australia, 2017; Leading Innovator of the Year Fintech Business Awards, 2017; Winner and #1 Smart Company in Australia, 2016; Winner 2015 Deloitte Tech Fast 50. Prospa is the king of small business lending in Australia and our #1 ranked company together with its veteran competitor Capify. With various awards like the Leading Innovator of the Year in 2017, and spotless reputation in the market, there is not much we can say besides mentioning a whooping 95% satisfaction from users – the highest in this industry and perhaps in all of Australian FinTech. If customers love Prospa Finance, then we do too. Prospa is an excellent online lender. The entire process is streamlined and easy, and the likeliness of approval for loan is higher than with most other lenders. Customers are being treated respectfully and the terms and conditions of the loan are transparent. This is exactly what we would expect of an industry leader. 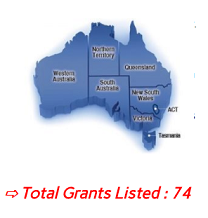 Prospa Advance Pty Ltd (trading name: Prospa) was founded in December 2012 by Beau Bertoli and Gregory Moshal, with the company headquartered in Sydney, Australia. In April 2018, the company employs between 150-200 people. Overall, Prospa has raised A$121 million since being founded. The company’s official website is www.prospa.com. How Did Prospa Become an Industry Leader? Prospa Loans is one of Australia’s leading business lenders. Their online application process is streamlined and their response and funding time are both in 2 business days or less. In many cases, the funds are received the same day you apply. Prospa has a 95% approval rating, and has been recognized with multiple awards – including the Best Medium Business Award in 2017 from Telstra Business Awards. Prospa business loans works with established businesses, and their loan terms are never more than 12 months. Prospa has a vision to change the way small business owners experience finance and lending. They specifically created their business model to respond and fund business owners quickly – understanding that sometimes small business owners require funds much faster than traditional lenders can provide them. Their application process is entirely online, and they work to make it easy on applicants to access the funds they need. They were founded in 2012 by Greg Moshal and Beau Bertoli, and they’ve worked to ensure that small business is at the core of everything they do. As lending has become increasingly problematic for small businesses in Australia, Prospa has continued to work to simplify how their lending process operates. They’re recognized as a financial company that’s changing the game by many – having been interviewed by several publications and awarded several honors for their innovative work in the financial industry. The source of its funding has been primarily from private equity firms that have completed 4 separate funding rounds. The most recent was done in July 2017, designated as ‘debt financing’. Propsa completed a private capital raising of $20 million as part of expansion and growth plan aimed at extending its business operations, adding staff and conducting further sales and marketing with view of growing its client base. Entrée Capital is a London-based venture fund that funds multi-stage startups and companies all over the world. Partners for Growth (PfG) provides custom debt solutions to private and public technology and life science companies. AirTree Ventures is a group of experienced investors and entrepreneurs based in Sydney. Square Peg Capital aspires to be the leading Asia Pacific based investor in venture and growth stage online and technology companies. IronBridge Capital Management help clients with investment management. Prospa provides unsecured business loans to small businesses in Australia and is Australian owned and operated. Using a smart proprietary technology platform and a simple online application process, Prospa gives small business owners a fast and easy way to access finance and has already provided loans to thousands of Australian small businesses. For loans up to $100,000, Prospa does not take “security” for clients to access loaned funds. Security is required if clients fail to adhere to their loan contract document. For loans of over $100,000 Prospa takes security in the form of a charge over assets. Prospa does not generally take mortgage over a borrower’s home, although it could considered as part of the asset-based securitisation process. Asset-based borrowing is when a business owner uses an asset they own to secure a loan. The asset can be either a personal asset like the family home, or a business asset like a truck or piece of equipment. There’s no compounding interest, no penalties for early repayment and no additional fees (as long as clients keep up with repayments on time). We have found a significant number of Prospa Financial reviews online – over 300. This is a rarity in the lending space. What’s even more rare is that vast majority of these reviews report that Prospa provides an excellent lending experience. While there are some reports of poor customer service, the general consensus is that Prospa makes it easy for a small business to apply – and 92% of eligible applicants are approved within 2 business days (often sooner). The only drawback we have discovered from reading through these reviews is that sometimes Prospa’s interest rates are higher than expected, but it is really depends on the applying business. Prospa boasts one of the nicest websites in the business lending industry. The site is clear, straightforward, attractive, mobile friendly, and so is the application process. All in all you don’t have to fill in excessive amounts of details to sign up, unlike some other lenders. 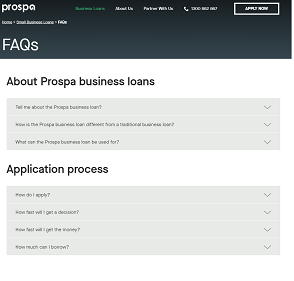 The FAQ’s are really nice, the About Us page is complete, and the Business Loan Calculator is handy (although our own business loan repayment calculator is nicer). This is all you would expect of a lender’s website. Startup: Prospa prefers to work with companies who have been in business for several months and have a consistent cash flow established. Bad credit: Yes, Prospa does factor credit score, but among other things. Sole trader: Yes, Prospa can fund sole traders. Established business: Yes, Prospa will accept any established business.